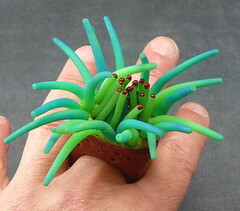 This ring by Malodora is made of pure awesome. It is this week's RAW entry for Malodora. Previous rings have been pretty amazing. Actually a lot of Malodora's stuff is--amazing and made with awesome sauce. I'm her newest biggest fan! Heck, I want to purchase all the stuff in her shop! You need to check it out. Its organic, and a bit twisted. But twisted in a most fabulous way. crazy cool, and just a bit different. I can't decide if Im inspired or intimidated. Probably a bit of both!